Almost six month ago Mind@Work launched a very innovative toy. 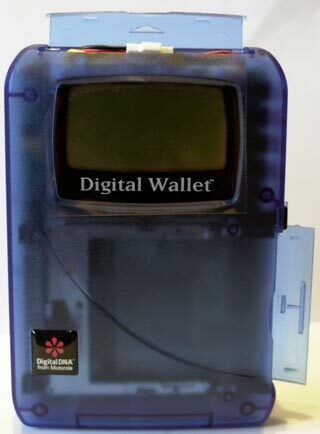 The Digital Wallet. Expected by a lot of digital photographers in order to avoid the purchase of expensive or very expensive memory cards this unit directly met a certain success. For myself a notebook already owned was my solution on the road, a few Lexar 128Mb (8x) CF and some other brand CF were enough to insure a least a half day or a day of shooting with my D1 using NEF format. Once shooting session finished, transferring the CF to the notebook via a SANDISK PCMCIA adapter is a child game. Following via forums, Photokina visit and other Internet sites the development of other challenger and M@W lack of support to solve problems discovered by owners, I camped on my notebook solution. 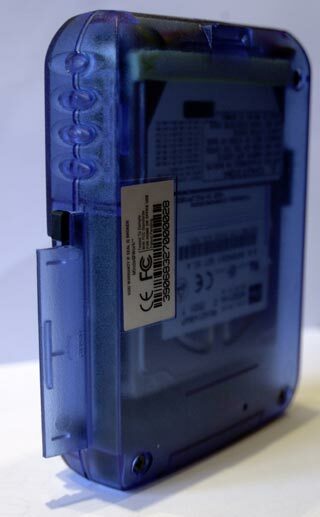 This week I received from my JOBO reseller (official importer for Europe) a brand new sealed clear blue DW for test. Globally well packed and provided with all accessories the DW plastics once the in hands look cheap. This feeling is in my opinion increased by the blue transparent plastic and the view of all parts inside the DW. The first hesitation comes with the time to introduce the battery, big fingers needs a small screw driver to open the door without breaking it. The same feeling is back when manipulating the PCMCIA door. If it was my DW I would immediately remove this door before loosing it. The cable docking unit is a great idea but would have been perfect if the DW could stand up in it with the cables plugged in the back of it (like a Palmpilot in his cradle). After 4 hours of charge the first download of a full 128 MB Lexar 8x CF seems very quick compared to the time I am used with my notebook. The last test represent the time needed to copy files from the Digital Wallet to the IBM Intellistation via USB port. The digital wallet is surprisingly quick downloading the images particularly with the bigger cards. The installation of the drivers under Windows 2000 were simple but required a complete restart of the computer. My objective is not to judge the software provided with the DW as I do not plane to use them. The DW works correctly and is quite easy to use, the buttons feeling is not great but the machine act just as advertised by Minds@Work. If you already own a notebook, or travel in civilized area keep going the DW is an expensive toy. The PC gives you the ability to view your pictures (With mine the bibble quick view and thumbnails works great.) even if the download time is longer. If you need lightweight equipment or plane some safari trips than the DW is a good tool to add in your track bag. Just buy enough batteries or better add a switch between the batteries and the unit.